Let me start by stating that this post is not putting down ANY forms of classroom management! I write this assuming that EVERY teacher does what works best for them and their students. We come to this profession because we want to ignite a love of learning and help children discover their potential. When you have that as your primary goal (and I know you do! ), the rest is… well, the REST! Now, let’s get to talking about this marble jar! Isn’t it pretty? My kids think so too! Call me old fashioned, but I do not reward students for expected behavior. If the direction is to “Line Up Quietly,” you are expected to do it. If you remain focused during math centers and finish your work, that’s great! That’s what you were expected to do! You explained the directions to your friend who was absent yesterday? Thank you for being a kind friend. That’s what’s expected of students in this community! That’s not to say that I don’t acknowledge their efforts and hard work! Oh no! Specific praise is a good friend of mine, and I enjoy pointing out what students are doing well. I know some behavior experts will say that’s a reward, and positive reinforcement. Yes it is, but it’s not done publicly, and does not involve anything other than those honest words. This is where I am trying to draw the distinction. Please don’t get me wrong! I do not have a magical classroom where every child does everything right all the time! WE ARE TALKING ABOUT HUMANS, NOT ROBOTS! (and little humans no less!) Things go wrong all day, just like every classroom. It’s just that I choose to not reward my students for doing the right thing. It’s what’s expected.That doesn’t mean that I’m a bland, dreary teacher who is opposed to celebrating! On the contrary! I feel that by not celebrating when we meet expectations, we can place our focus on when students exceed expectations, and encourage them to do it often! These are the two things in my classroom that will earn students an external reward (in our case, a marble in the marble jar.) 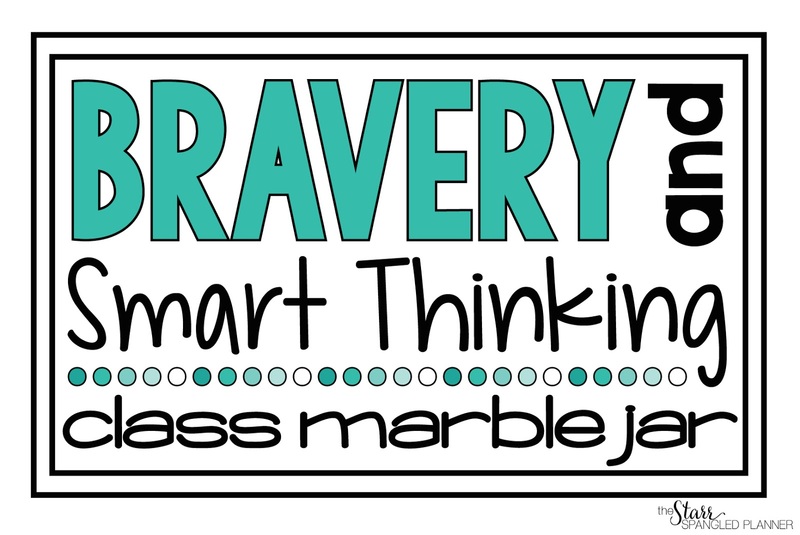 You may be asking yourself, ‘Bravery and smart thinking? What does that look like in a classroom?’ My favorite part about this is that it looks different for EVERY child! The whole class made it through state testing! A student asks a probing question during a lesson that drives the conversation and helps everyone think deeper about the topic. Is this making sense? It’s very individualized, but very manageable because YOU KNOW YOUR STUDENTS! Every time my students exceed expectations by demonstrating bravery and/or smart thinking, they get to put a marble in our class marble jar. I keep the marble jar close to our meeting area, because that’s where a lot of our whole group learning takes place, and I like to keep it close! My students love watching the marble level rise as the weeks go by. When we get close to the top, it gets really exciting. Students are not allowed to touch the jar. This is not because I’m mean, but because I’ve had it spill too many times before putting this rule in place! When it gets close to the top, I place my hand across the top of the jar and if I can feel the marbles on my palm, it means they have reached the top. The excitement this suspense creates is amazing, and I wish I could bottle it up! Once we reach the top, we throw a “Marble Jar Party” to celebrate all of our bravery and smart thinking! This is a party (almost) completely designed by the students. We’ve had an outdoor games party, a movie and popcorn party, a walk to a neighborhood playground party, and countless pajama parties. The important thing is that it is THEIRS! I would like to put a big footnote in here to acknowledge some important points. First, it is critical to note that many students do not come KNOWING what is expected. My kiddos come to school with varying school and home experiences, and I always need to keep that in mind! Some students need significant explicit modeling to ensure that they internalize these expectations. It would be very unfair of me to expect them to do things they do not fully understand. Additionally, it is important to help students recognize how expectations can differ from one setting to the next. It is only once a student can demonstrate a complete understanding that I expect them to do it. I also want to acknowledge that there will be students that require frequent check-ins to ensure that they are able to regularly meet expectations. I prefer to use individualized behavior plans for these students, as each of these students is struggling for different reasons. I personally feel that my students do best when these behavior plans are kept out of view of their peers. I know they want to do the right thing, and by helping them feel secure in their environment, I feel that they are more available to work for it! This is what works for me in my classroom, with my student population! What works for you and your students? We have something very similar to this but I love the bravery and smart thinking idea and I totally agree with everything you said! I love, love, love you Aris! Thank you for the kind words and encouragement! Thank you so much for stopping by Ms. McGaha! I'm glad to know it provided some food for thought. Wishing you a wonderful school year! Jillian, I love this post! I totally agree, I never assume my students know what the expectations are, I Model Model Model, even how to put a glue cap on properly, hehe. I know that effort I spend up front is worth so much for the rest of the year! Hope you are relaxing and getting recharged for the new year! Thank you much for your thoughtful comment, Christina (as always!) It is SO WORTH IT to front load the year with modeling behavior and expectations. Don't feel bad about the glue stick caps! I don't even give my kids chairs on the first day until we've modeled and practiced how to sit in them properly! Oh my, wow! I never thought of that! I haven’t had chairs I could separate from desks before, but this year I will! What an awesome idea! ? Thanks! Haha! If you find out, please let me know 🙂 I'm so glad you enjoyed the post! Hi Hannah! I would love to share, but I cannot share actual behavior plans to protect student confidentiality. Perhaps I can write a post on creating behavior plans to help! Thank you for the great idea! Hi Jillian!! I too am interested in learning more about individual behavior plans. Have you created a post on that? Could you possibly show some examples with no names? Thanks so much!! I am only 15 but have wanted to be a teacher pretty much all my life. I recently attended the Kansas Future Teacher Academy at Emporia State University and you basically hit on all the points we talked about. 1) connecting with your students: with the behavior plans and getting to know the students, you build a connection with them that cannot be replaced. 2) Student Diversity: You recognize that each student is different. Like you said, bravery and smart thinking are demonstrated differently by each child. Just wanted to say that in my books, you seem like an amazing teacher! I totally agree with everything you wrote! 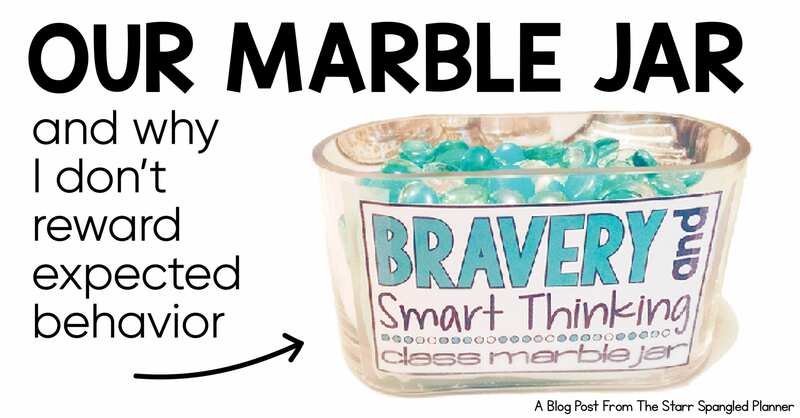 I teach fourth grade and am wondering, would you use the class marble jar for fourth graders and would there be any differences you would implement or introduce? 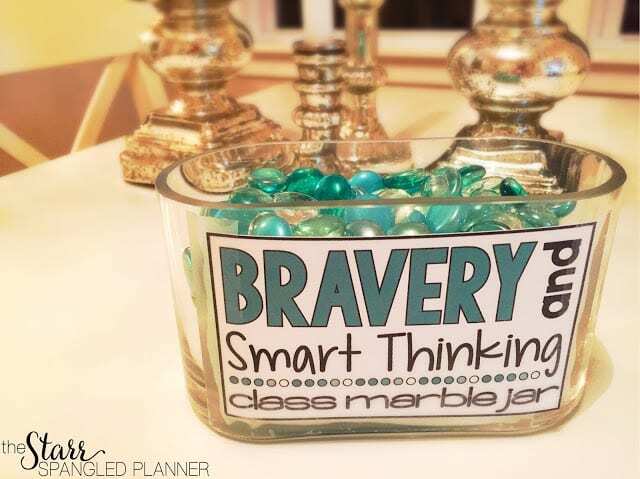 I really like the idea of the classroom marble jar. What about middle schoolers (gotta love’em)? I LOVE this idea!! At my school we have to do a lot of teaching what is expected and we reward for it because that’s what we are teaching them (we have a lot of ADHD kiddos, as well as those who have executive functioning and social skills challenges). I like the idea of an individual student’s success contributing towards the class. I’m retired now, but still LOVE this idea. I did something similar and called it our kindness jar. When it was full, the class decided on an act of kindness they would do. They came up with some great ideas and felt rewarded in lots of ways. How great is this!? What I love is how this can be used at all levels and settings. Thank you for taking the time to share!